I don’t know which is more fun: trying to walk blindfolded through two trees (well watching other people try to do it), or riding the chicken car. Whenever I visit Yogyakarta in Central Java, Indonesia I try to convince my groups to join me for an evening of fun and games at the Ulun Ulun Selatan, the southern square of the Sultan’s Palace. As here, every evening Large crowds gather to try their luck waking blindfolded through two large and ancient Banyan trees, as the local belief is, if you succeed in this task your heart is pure. 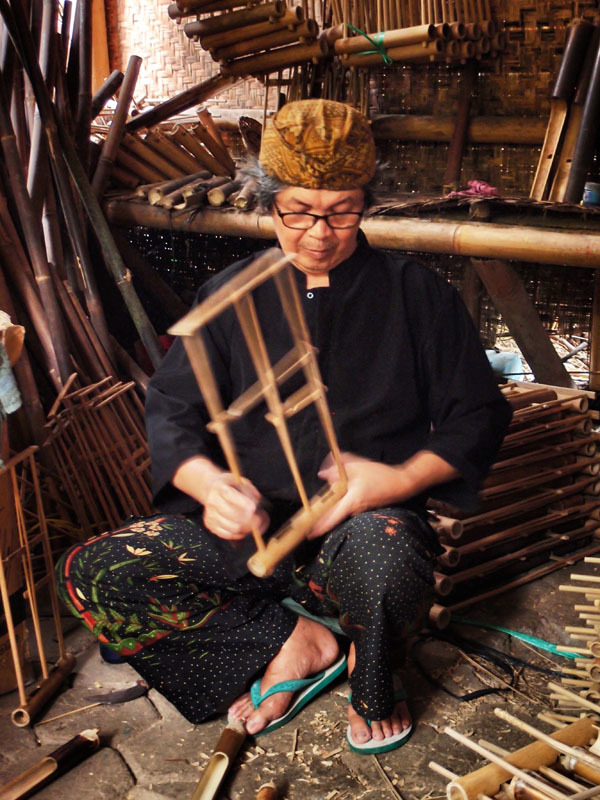 The game is known locally as “Masangin“, an abbreviation for masuk antara beringan, literally ‘entering between banyan trees’. It may seem a simple task, as the trees are rather far apart, but it’s surprisingly difficult, to a degree that I’m sure there’s some magic involved. 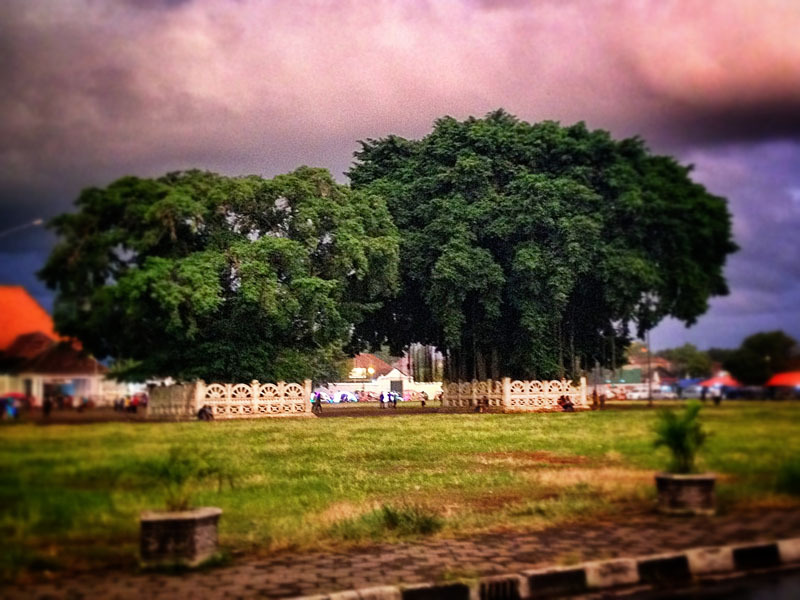 The “magical” trees of the Alun Alun Selatan. Sultan’s Palace, Yogyakarta, Indonesia. 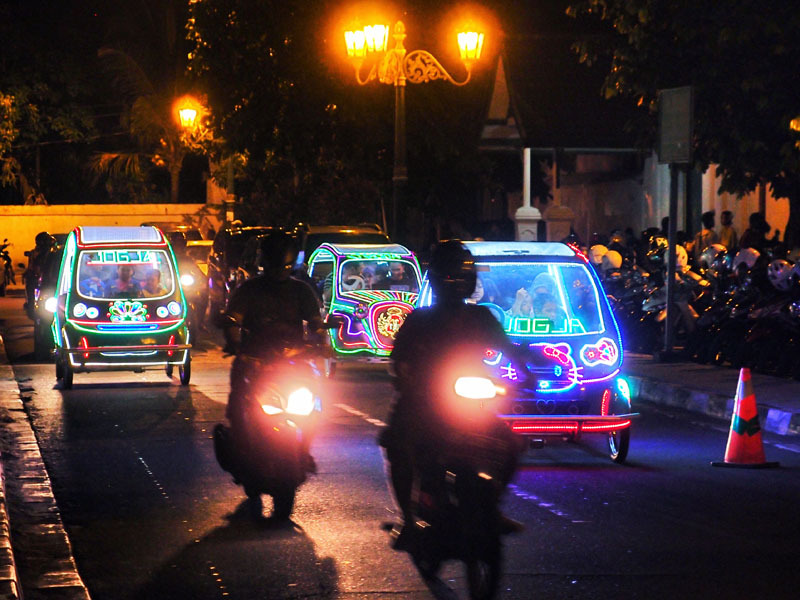 Yogyakarta and particularly the Kraton area (Sultan’s palace), are full of mystical stories and legends. 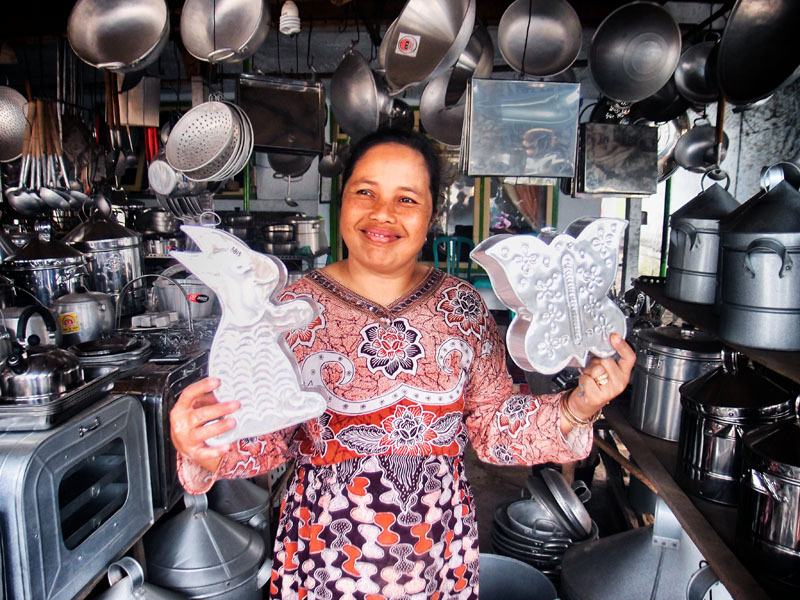 It’s a melting pot of Animism, Hinduism, and a Javanese mystical version of Islam. The palace itself is the geographical centre of Yogyakarta, and is also the centre of an imaginary line running form the very active volcano, Mt Merapi in the North, to the wild and dangerous sea at Parangtritis Beach in the South. Legend has it that the Queen of the sea is the spiritual wife of the Sultan, and once a year she comes for him in her chariot following this very road. The chicken car – a mobile karaoke extravaganza. Pedal cars and real cars and motorbikes fight for space on the road. 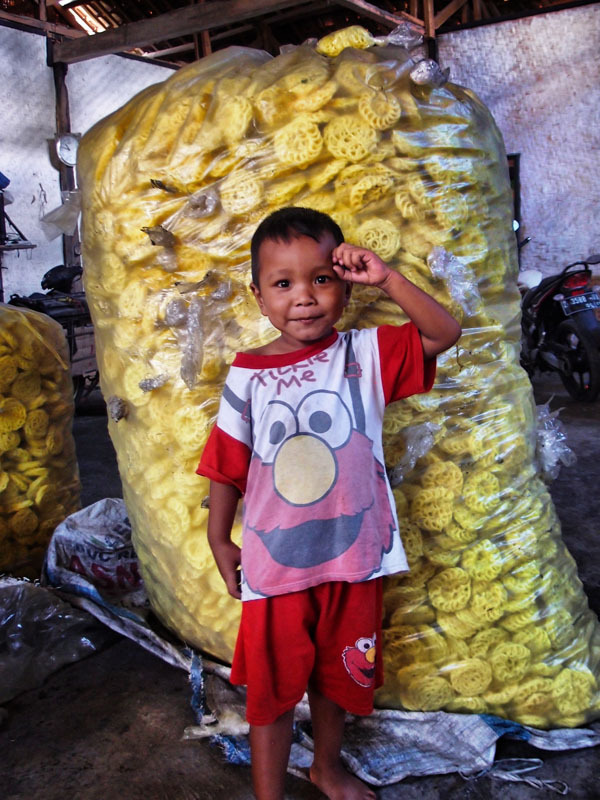 Yogyakarta, Indonesia. In recent years this game has become so popular, that other businesses have taken advantage of the instant crowds, and have opened here too. 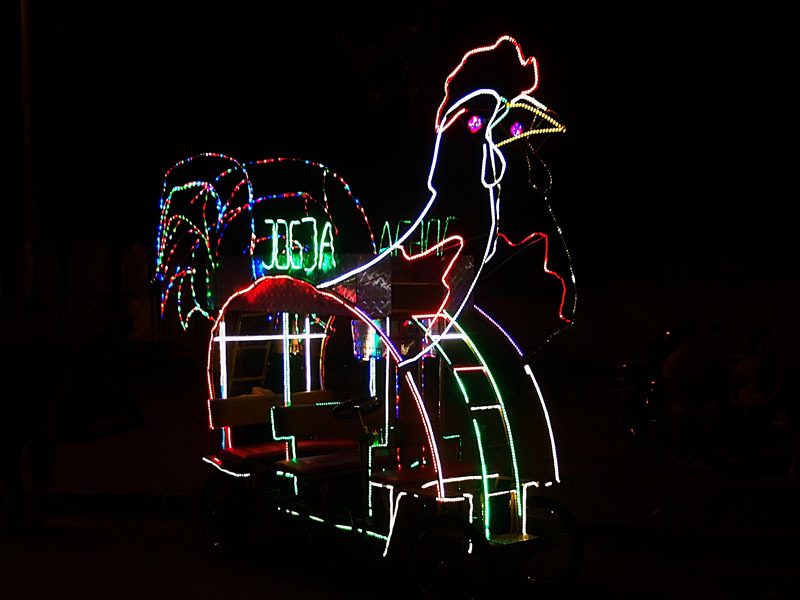 The are many stalls selling glow sticks and flashing light novelties; food stalls, and the aforementioned chicken car. Actually there is more than the chicken, there is the shark car, and numerous cartoon character covered beetle cars. They are pedal powered mobile karaoke machines covered and adorned with multicoloured flashing lights. You pay to peddle one or two circuits of the square jostling for space on the road amongst the regular cars and motorbikes. I’ve paid between 30,000 Rp and 80,000 Rp ($3–$8 USD) for the same journey, so depends on your bargaining skills and how many in your group. The chicken car, however, is rather special. It’s powered by four people peddling, with space for two extra passengers on the bottom (5 extra if you’re Indonesian), and another 4–6 passengers on the top level (there is a ladder to climb). The music blares from the speakers and everyone waves to each other as they pass. Some take their time and slowly meander around the street, others hoon on by, narrowing avoiding other cars. I can’t guarantee the health and safety of this activity, but I can guarantee that it’s LOTS OF FUN! However, be warned, don’t combine the two and wear the blindfold while, driving! Growing up in Australia in the early 70’s, it was a common Saturday afternoon treat to go to the cinema (we called it ‘the pictures’). There was the main feature, of course, sometimes a double feature, and usually preceding this, a short film followed by intermission – a chance for the candy bar to increase profits. The short was often a documentary produced by the Canadian Film Board. It was often about the rubber industry. Often. Odd. 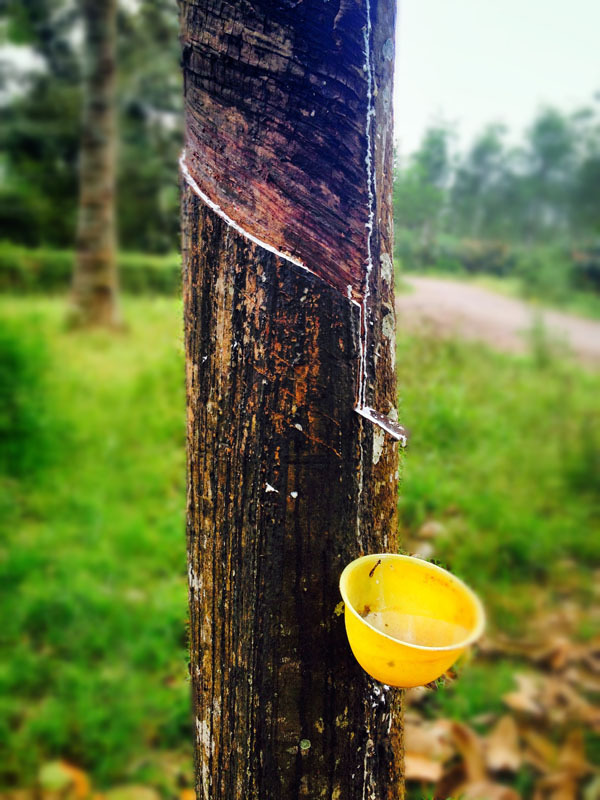 We saw how the trees were tapped, and the latex collected in small coconut cups. The collectors were always wearing pointed hats from some generic South East Asian country. The formal voice over in a plummy, trying to be British, but with a Canadian twanged accent, explained the process. I knew all about rubber. Well that was my memory of it anyway. Collecting latex. Glenmore, East Java. 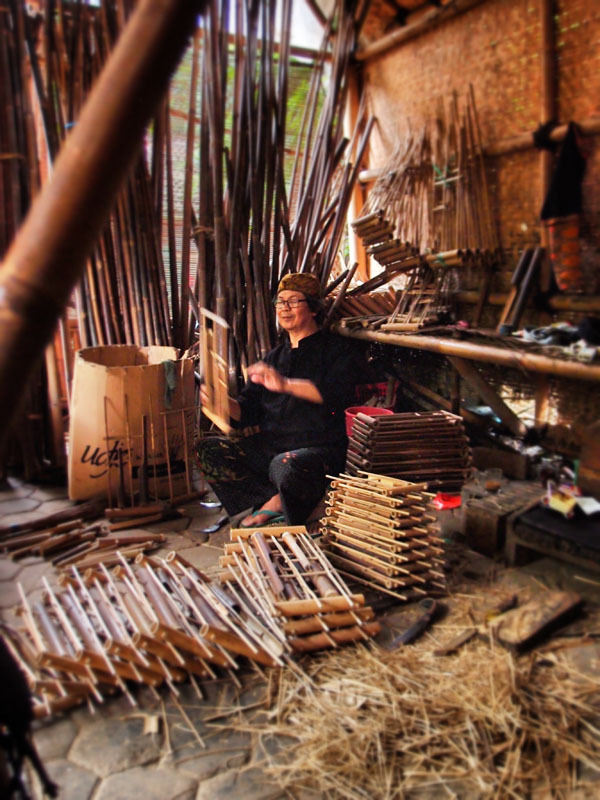 Having spent several years now in South East Asia, escorting tour groups – I too have been explained this process again by our local guides, as they have shown my groups around rubber plantations in the various countries I have visited. I have seen the sticky latex collected, poked my finger into the gooey liquid, and let it dry, then peeled it off. I’ve wondered if it hurt the trees as they bleed. I’ve even slept in dark and smokey longhouses in the jungles of Borneo surrounded by stacks of the stinky semi processed rubber matts. 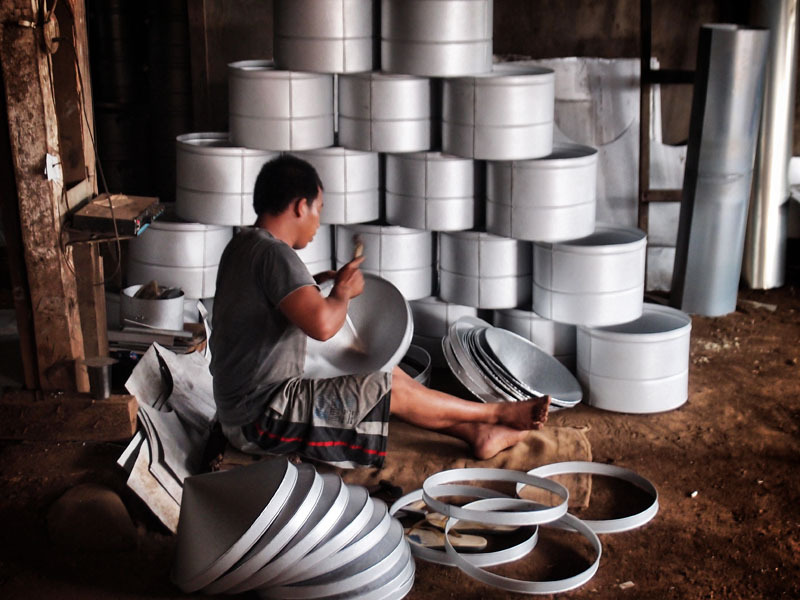 It was not until recently that I have learnt more about this process and seen the next steps in the production, as one of our trips take us to Glenmore plantation in East Java, Indonesia. 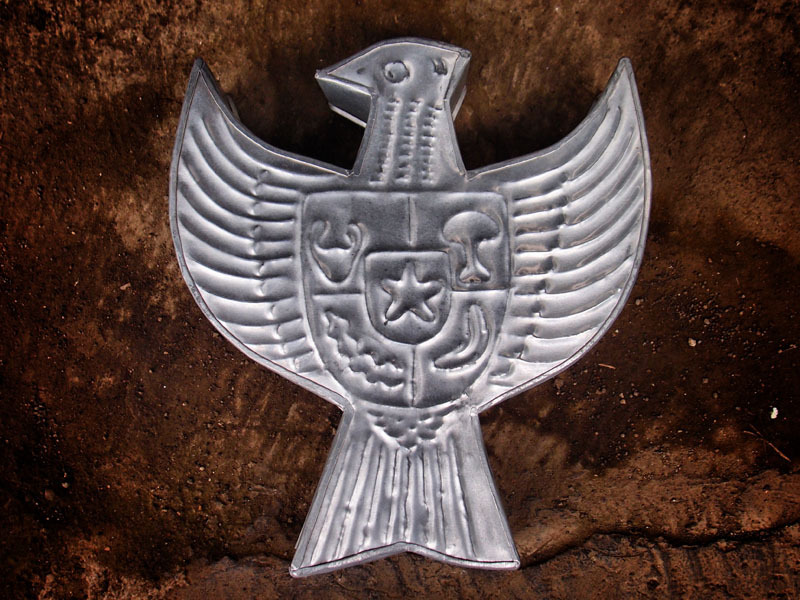 Glenmore, an incongruous name for an Indonesian village, was began (so one story goes) by Scottish mercenaries who had been in the service of the Dutch some time in the mid 18th Century. As they had been fighting the British crown, they were no longer welcome in their homeland, and exiled to make a new life in the Dutch colonies. 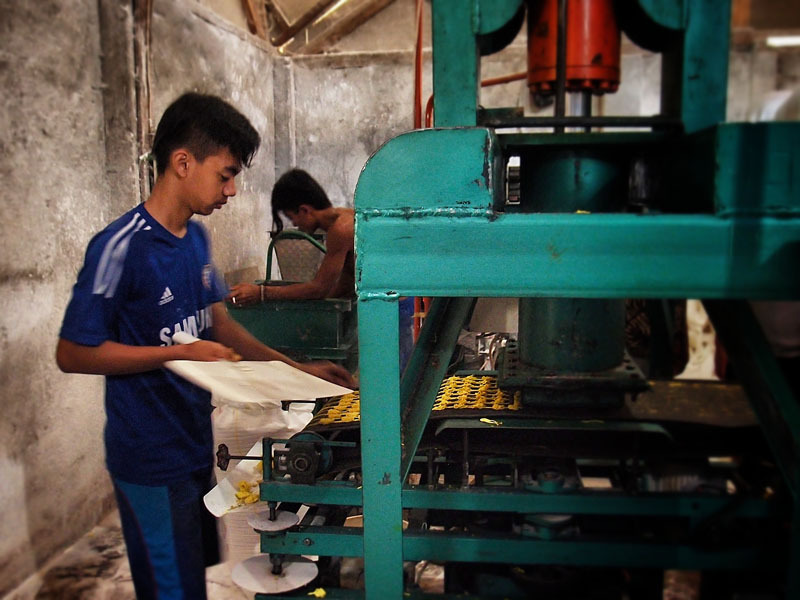 Today the plantation here is still the largest employer in the village, and the rubber processing factory continues to operate much in its original condition. I love stepping into the ‘living museum’ of an office here to pay for our tour. The time machine takes me into a room where the fan whirls slowly as a uniformed lady always types out my receipt. Yes, types clickity clack with an actual typewriter. With ribbon. And carbon paper. Often a group of uniformed men sit around smoking and drinking coffee. Yes, smoking cigarettes in the office – this is Indonesia where the anti-smoking laws have yet to take effect in many areas. Our tour of the factory begins in a large airy white room. The cement floor is wet and the whir of the rollers occasionally override the constant hum of the machinery in the adjoining room. 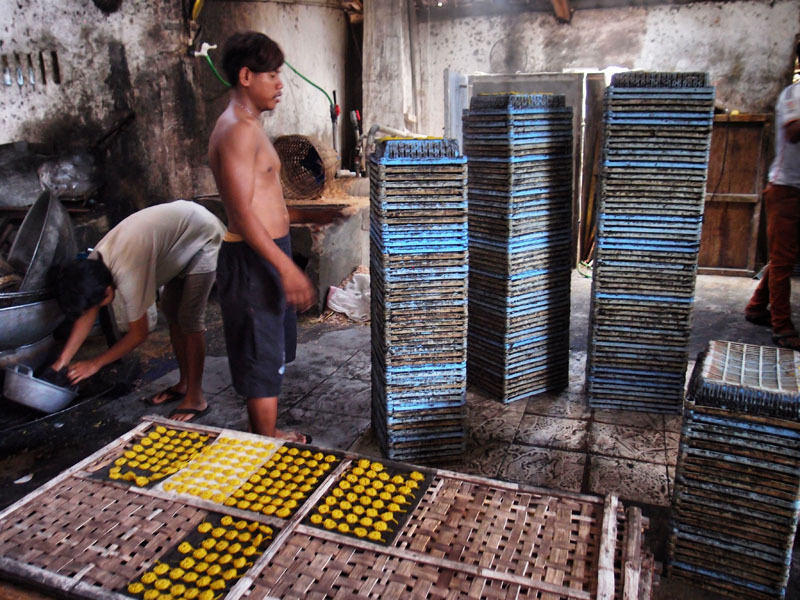 Workers, both men and women, are dressed in faded flowery sarongs and stained T-shirts. Some of the woman have headscarfs. All are wearing flip flops. Large water filled vats line one wall, and a watery conveyor belt ends with a series of rollers. 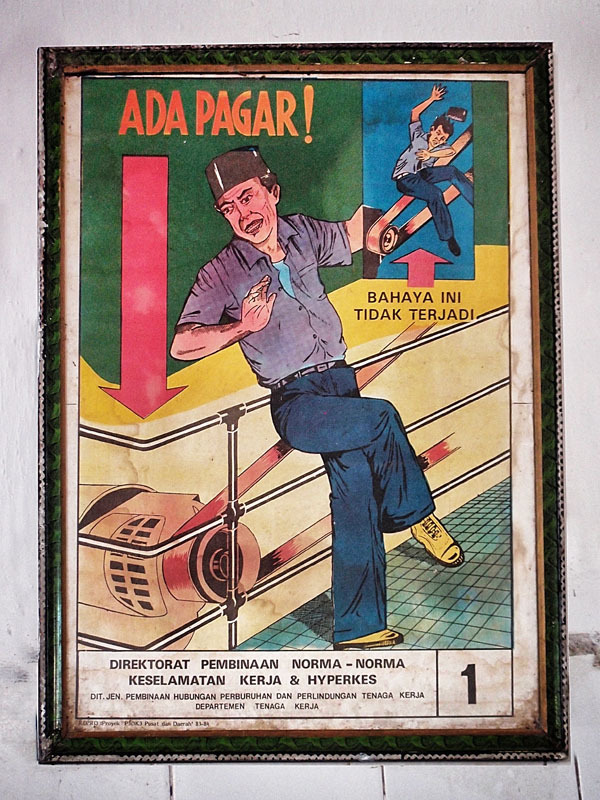 A few ancient looking safety posters adorn the wall warning workers not to trip on the belts and machinery. Our guide jokes that we are in the “condom factory”. He lifts one of the frames from the vat of water and revels a large spongy white sheet about 3cm thick. He explains that at this stage, acid has been added to the latex, and after several hours, it coagulates into this form. 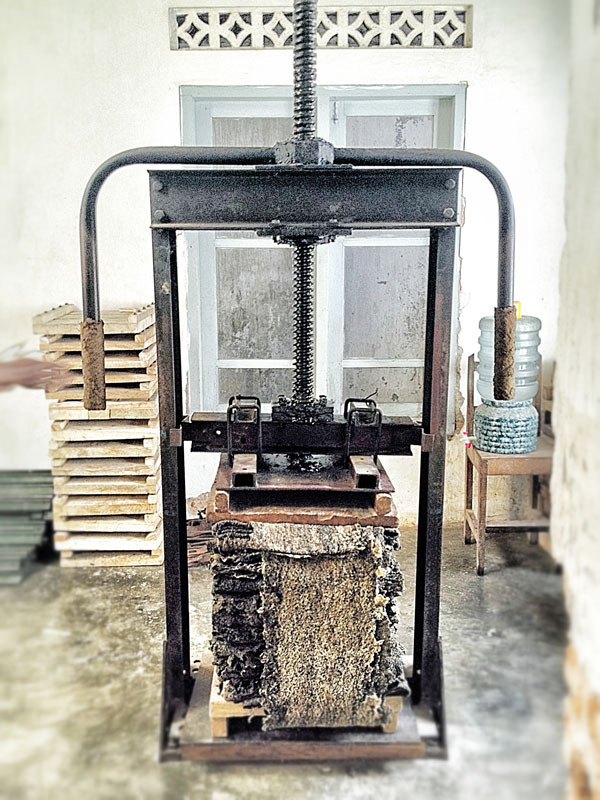 The sheets are then transferred to the belt, and are fed through the series of rollers. A worker aiding its journey by guiding it with his bare hands pushing the sheet into each roller, no safety guards to stop if his fingers accidentally follow the path of the sheet.The rollers wring out the excess liquid, and leave a criss cross ribbed patten, branding the mat with the Glenmore logo. Rubber sheets drying. Glenmore, East Java. 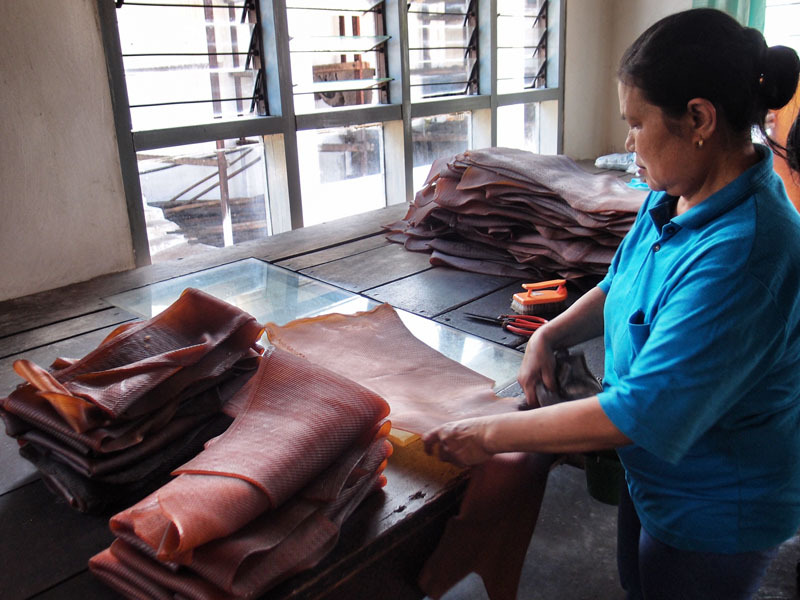 A woman sorts and grades rubber sheets. Glenmore, East Java. These thinner, firmer matts are now carried to the adjoining building, the door is opened and a blast of acrid heat whooshes out. This is the smoke-room. 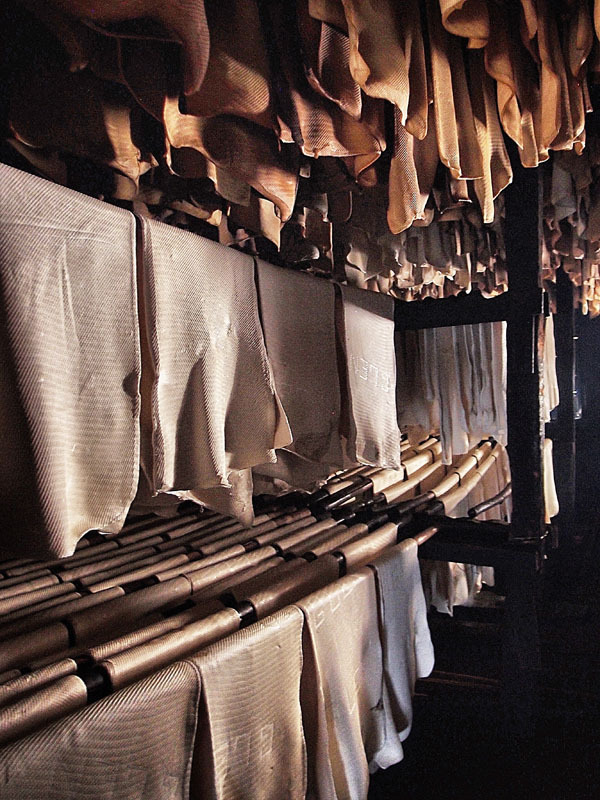 Underneath we can see the wood fuelled furnaces burning, heating the room to 50° C. The matts already hung drying for up to a week, have changed from opaque white, to a translucent golden brown, like flayed skin hanging over the bamboo poles. It looks like a serial killer’s storeroom. 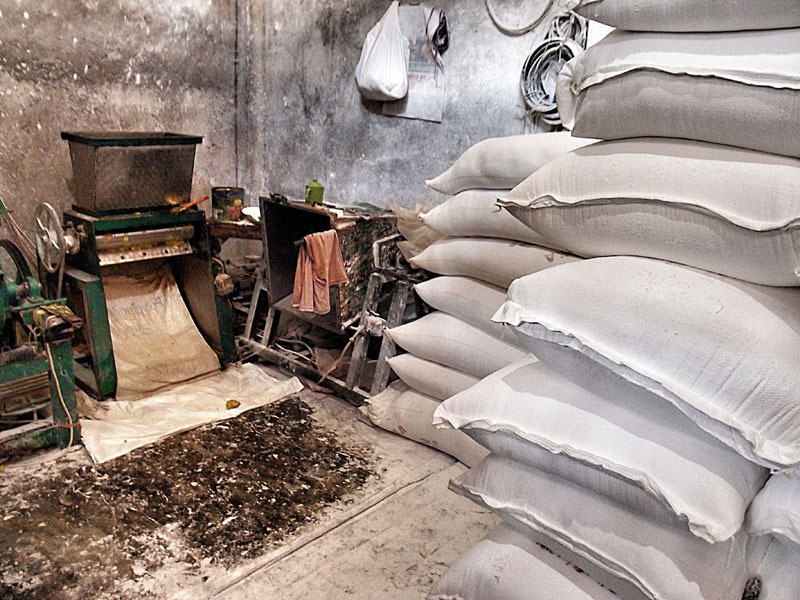 The smell and the heat are overwhelming, and our guide quickly shuts the door. The building opposite, also a similar drying room houses the poor quality rubber, the froth that’s skimmed from the tops of the vats. It’s black and bubbly, more like a filthy kitchen sponge. 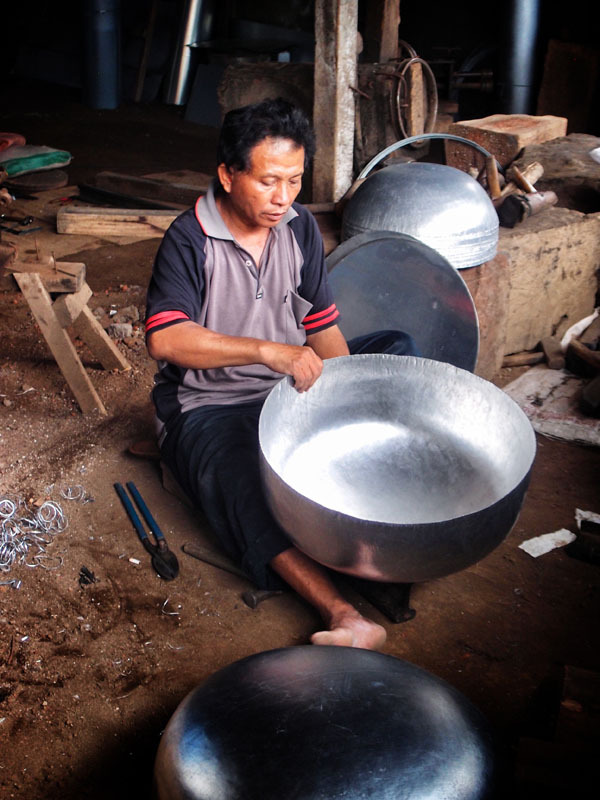 This will be used for the local market to make flip flops and foam mattresses. Baling machine. Glenmore, East Java. Our tour continues to the sorting and packing room. 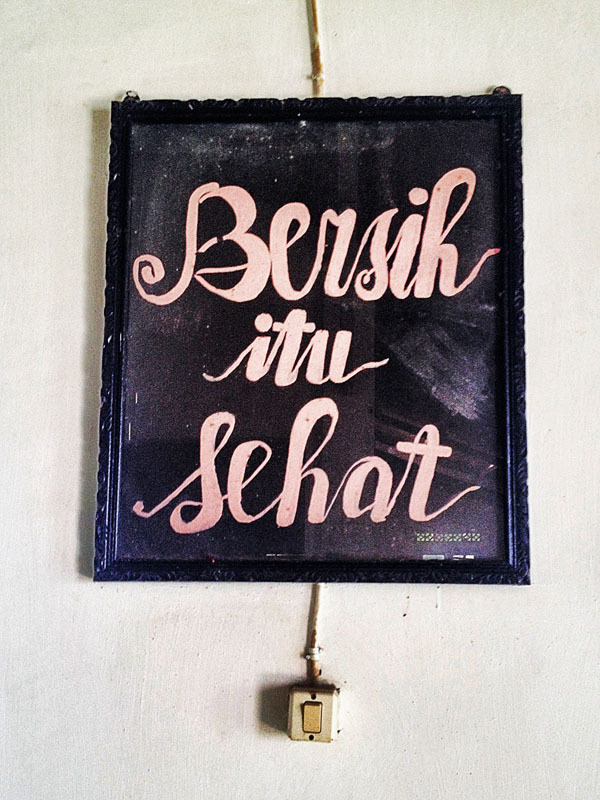 A hand painted sign in beautiful calligraphy announces ‘Bersih itu Sehat’ Clean is Healthy. We must remove our shoes before entering. 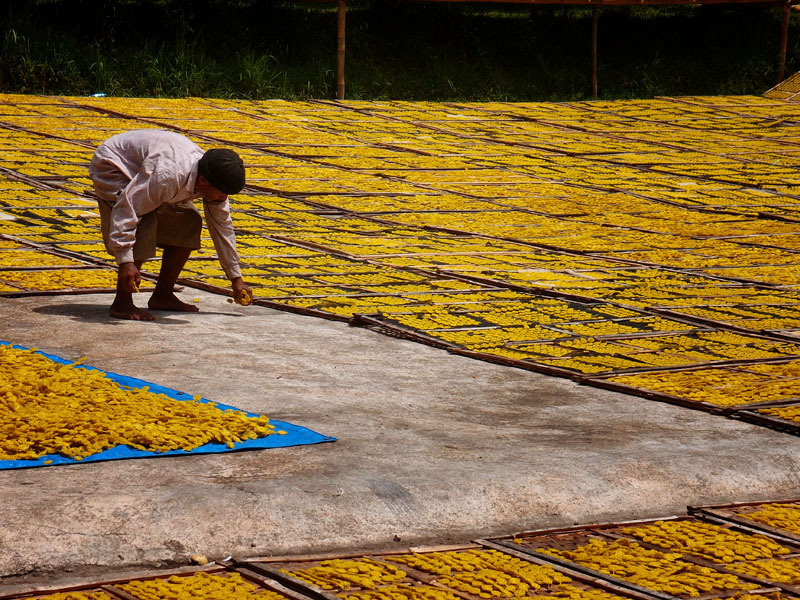 The now dried and smoked rubber ‘hides’ are inspected on the surrounding light-boxes. 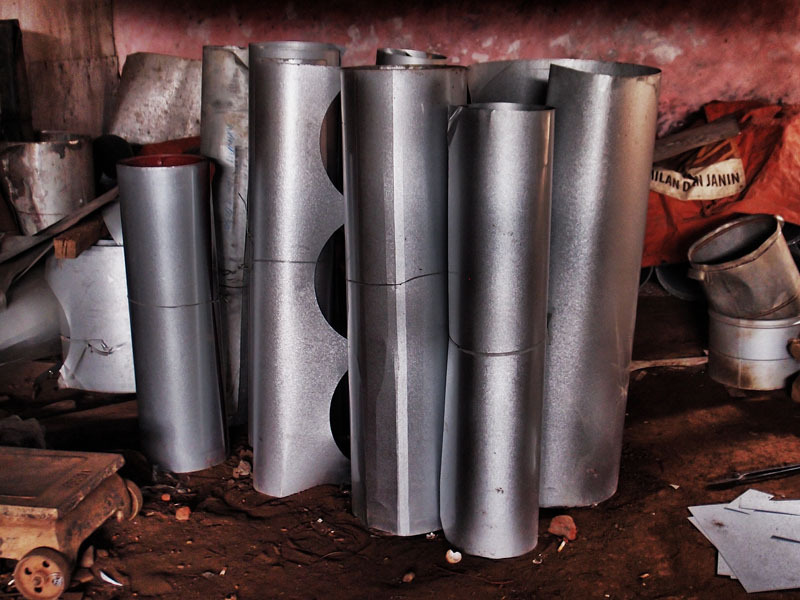 Small deformities are discarded using a blade cutter. The sheets are then graded, and sorted. There are two baling machines in the opposite corner where stacks of the rubber sheeting are compressed into large cubes. The huge vice is turned by a shirtless muscled man, the sweat beading across his shoulders. This is hard manual labour. Everything is manual here. 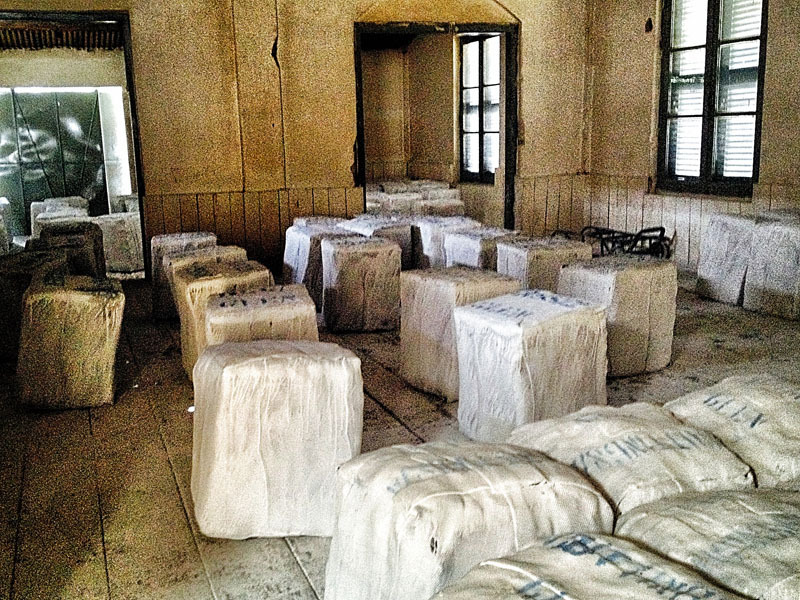 The whitewashed bales are causally placed on the slightly raised whitewashed wooden platform, like cubed chess pieces in a contemporary art installation, ready for export. Each one is worth several months wages for the workers. Rubber bales waiting for export. Glenmore, East Java. The heat of the day becomes too much for the group, so we exit and walk towards the shady forest of rubber tress. They are planted in even rows, and all bend slightly in the same windswept position, as though they are made of… rubber. Our guide expertly scrapes a slither of bark with his pocketknife, and the tree begins to bleed. I am back in the cool cinema of my childhood, all that is missing is the Canadian voice over. 11pm isn’t morning. 11pm is when I had to arise, after a 3am start earlier that day. Does it count as the next day if I catch a few hours sleep between? 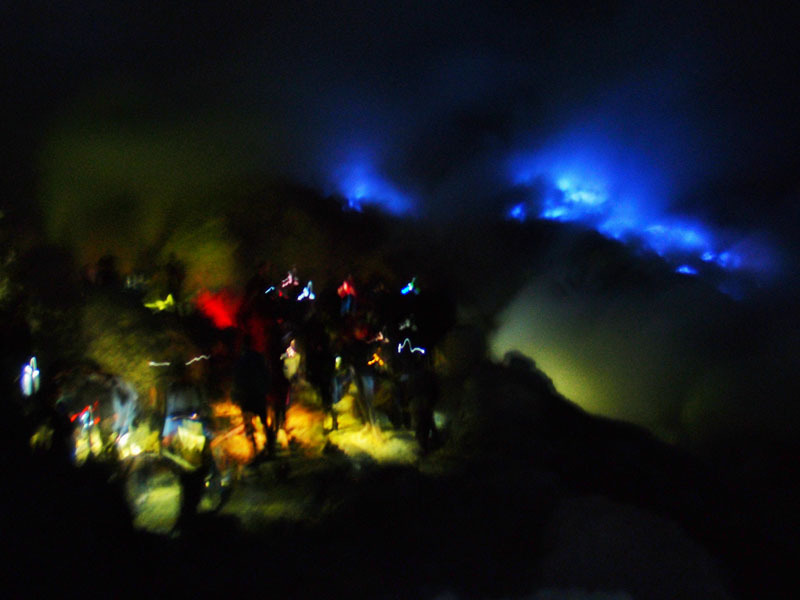 I was heading to see the ‘blue fire’ of Ijen volcano in East Java, Indonesia. The reason for my 3am start was Bromo Volcano – I accompanied my group to see sunrise, however there was no sunrise. Well, I speculate the sun did rise, but it was obscured by cloud. I have visited the magnificent Bromo many times over the years, and the moonlike landscape consistently awes me. Unfortunately for this group, the cloud didn’t clear until we had returned to the ‘sea of sand’ – still impressive nether the less. After a short ride in our charted mini van to the train station, followed by a comfortable train ride to Kalibaru, I was scheduled to do some research and a safety check for future trips at Ijen. I was hoping it was a daytime activity, but from all sources I asked, I could either do a sunrise trip, starting at 4am, or a ‘Blue fire’ trip at 11pm. 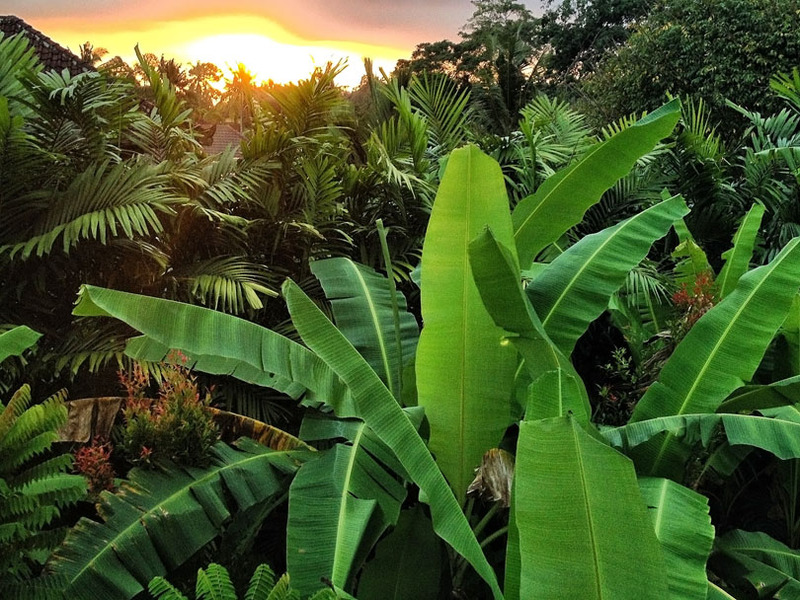 I have seen enough sunrises in Asia to last me a lifetime. They’re nice, but really, way too early in the morning. What is wrong with sunset? Usually much more spectacular, and a much better time of the day. Blue fire sounded interesting, but it was an all night activity from the information I had found. A two hour drive to the start, followed by a two hour walk to the creator, some viewing time, then reverse, returning to Kalibaru around 8am, so I was told. My guide said there was only another kilometer to walk. I was keen, but the sulphur smell was hurting my eyes and throat. He handed me a mask, the kind workman use for paint fumes, with a filter. It was a little tricky to fit, and hurt my nose, obviously built for Indonesian faces with much smaller noses. That was better. It was only another 200m to climb, then the path flattened out before the last few steep rocky meters down to the viewing area of the blue fire. The ill-fitting mask was pushing up my glasses, and as they are multifocals, my focal points were all wrong, and I misjudged a step and went sliding down to the barrier. Oops. A nasty bruise was already manifesting. In the darkness we could see the dancing blue flames below. My guide explained that the flames are the sulphur gasses, and further down a trail of blue ‘coals’ was burning sulphur falling down. He said that the trail of coals was dangerous for the miners below, and they would probably soon turn on the pump. On cue, a rumbling sound began and almost immediately the sound of gushing water. Fire hoses pumped out water, extinguishing the burning trail, and clouds of ash and smoke now covered the dancing flames. 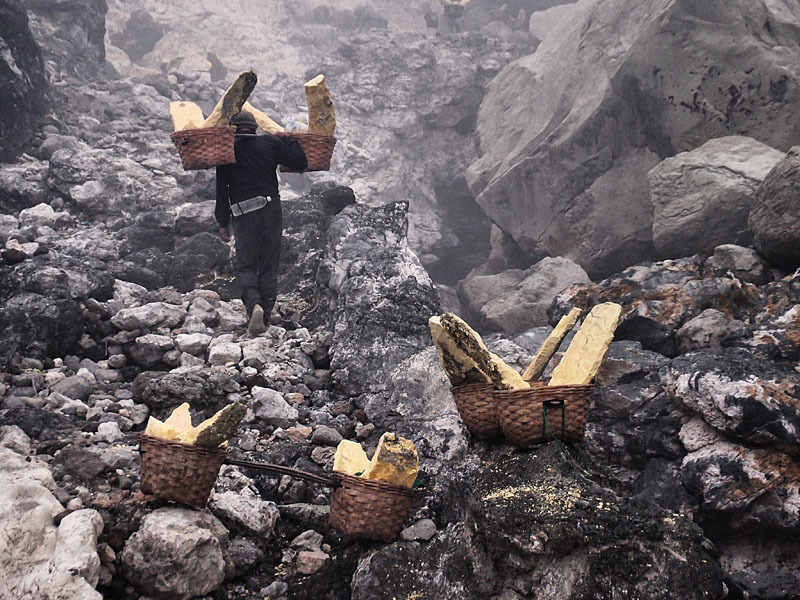 Miner carries sulphur, Ijen. East Java, Indonesia. My guide then led me through the gate at the end of the barrier following a few other tourists and the miners who had now began to form a steady trail; carrying empty bamboo baskets across their shoulders. The path was much steeper here, and in the darkness I couldn’t see if the path ending in a sheer cliff or a slight hill. I was cautious after my earlier fall, even though I had now adjusted my mask and glasses. We arrived at a small out-jutting rock, a perfect seat for taking in the wonders of nature below. We had another two hours before light, so I sat and quizzed my guide on all the safety aspects and possible dangers of the walk. He explained that he trusts the miners more than the government warnings. He said that the volcano is like a second wife to them and they know her moods and when she’s unhappy. They will continue to work sometimes when the volcano is officially out of bounds, and conversely stop working when there is no official warning. He said he has to follow the warnings, but will always stop too if the miners think she’s having bad day. I needed a drink, so opened my mask. The burn of sulphur was overwhelming. I don’t know how the miners and my guide could stand to be inhaling that potent gas. The sky was lightening so we continued down the path to the crater lake and nearer the source of the miners income. On the way one of the miners was pouring molten sulphur into small moulds – making Hello Kitty and cute turtle sulphur shapes to sell to tourists. Apparently the lake is the largest highly acidic crater lake in the world, with a pH of 0.5 (whatever that means). My guide dipped in his hand, saying it was warm and ‘buzzy’. Buzzy, as in the sulphuric acid will melt your fingers, no thanks. It was a pretty blue though. 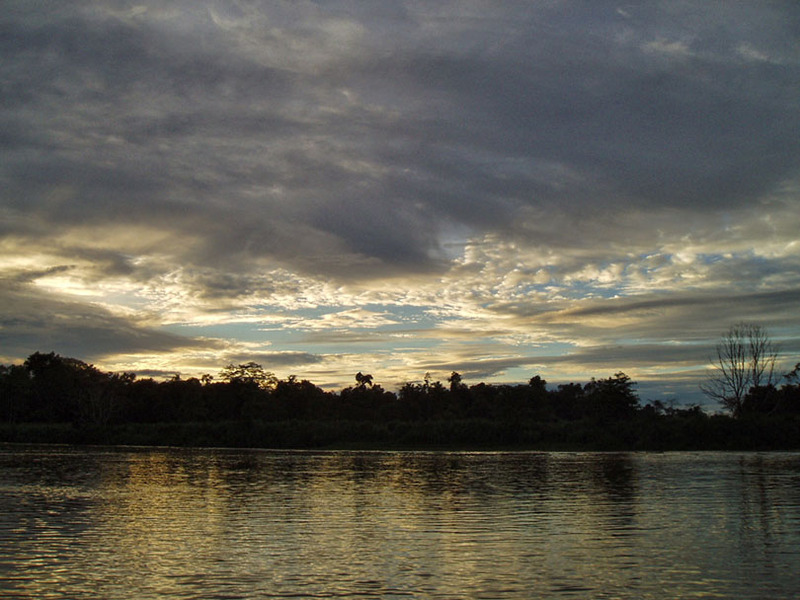 The sun had now risen and the blue fire was no longer visible. But I could now see clearly the ‘mining’ process. Sulphur smoke was being expelled in giant clouds, and underneath, a series of pipes channeled molten sulphur forming red puddles that soon cooled into the familiar yellow rock. Miners dug away, mostly using rocks as tools, dragging away shards of the yellow brimstone. They filled their baskets, first with small broken rocks, then expertly balancing two large slabs pointing outwards in opposite directions. They looked like butterflies. The baskets were then hoisted onto scrawny and weathered shoulders for the arduous journey up. The miners had no masks and most were only wearing flip flops. Groups of them slowly ascended, the butterflies floating alongside. They stopped every few minutes. Those baskets were heavy, and had no padding on the thin bamboo beam that stretched over their backs. 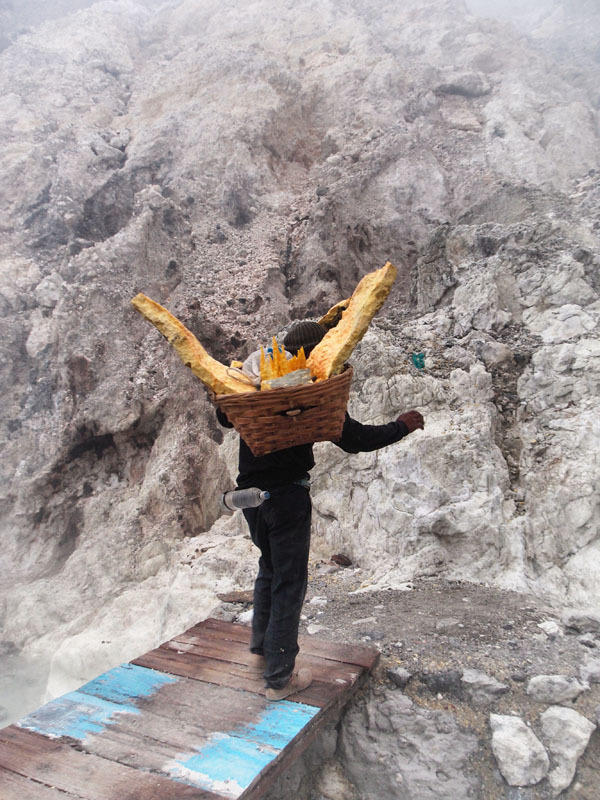 Miner, Ijen. 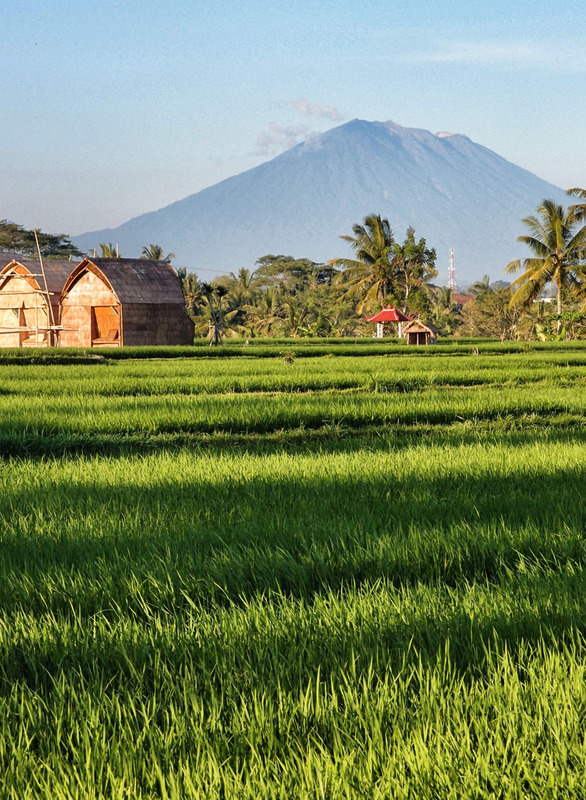 East Java, Indonesia. I followed the drifting butterflies, entranced by the colours around me, the pale whitish rock of the crater, the bright yellow of the sulphur, the flashes of red and blue worn by the miners and discarded plastic rubbish. At the top, near the barrier once more, a warning sign was now visible in the light. NO TOURISTS BEYOND THIS POINT – IT IS FORBIDDEN TO GO INTO THE CRATER AREA. My guide said it was an old sign, but was now okey – it had been erected when the volcano was much more active. Floating along the path of the butterflies I returned to the parking area. I had some questions to ask at the government office before I left. Outside the office were several more waring signs – they looked new. I queried the officials, and was informed, that indeed the crater is not open for tourists, and that guides don’t take tourists beyond the barriers into the mining area. They don’t. Apparently.